As in past Pew Research policy priority surveys, Republicans and Democrats at the start of 2013 offer differing views about the importance of many of the country’s most pressing issues. 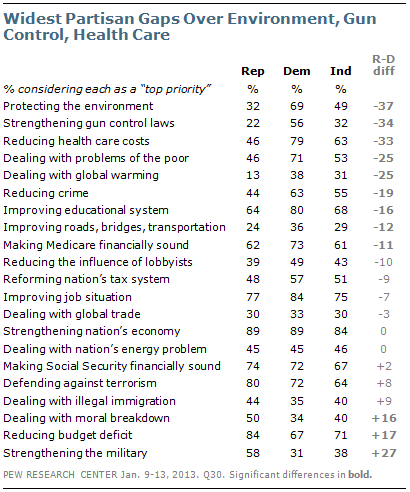 Broad majorities of Republicans and Democrats see the economy and jobs as top priorities. More than seven-in-ten Republicans (74%) and Democrats (72%) say making the Social Security system financially sound should be a top priority, though they may have different views about how to do so. But there is far less consensus on other issues, with some of the largest differences over the environment, gun control, and health care. About seven-in-ten Democrats (69%) say protecting the environment should be a top priority, compared with 32% of Republicans, a gap of 37 percentage points. Overall, 52% of Americans say the environment should be a top priority for the president and Congress, putting the issue in the middle of the 21 tested. And, while President Obama named climate change a top priority for his second term, the issue of global warming is at the bottom of the public’s 2013 list. Overall, 28% say this should be a top priority in 2013. Democrats, though, are 25 points more likely to say this is a top issue than are Republicans (38% vs. 13%).